Happy Friday everyone! We are having just glorious fall weather here in Virginia - I love it when the air turns crisp and cool. Time to break out the sweaters and jackets again and enjoy the beauty of God's paintbrush all around us. The colors are truly amazing, I never tire of looking at them. This week it was very hard to stamp as I not only have dear family friends visiting for a week, but I'm still trying to put the house back together from all the new floors! So, my Blogger's Challenge card is one that I designed for stamp camp earlier this month. Today's theme is for Halloween. Well, because we don't celebrate this event in our home, (hey, I'm all for the chocolate, but not at all for the scary stuff) I made this card as a harvest card instead. At camp, anyone who wanted to turn it into a Halloween card was able to add the jack o' lantern face from the Autumn Harvest stamp set to the pumpkin and use the Happy Halloween greeting from the All Holidays stamp set. For my card base, I started with Old Olive cardstock and overstamped it with the Canvas background. I purposely left it looking mottled and spotty so it would look worn. The next layer is More Mustard cardstock stamped with the leaf from the Autumn Harvest stamp set. I stamped it in Chocolate Chip using graduated stamping for a tri-tone effect. This layer was deliberately cut short on the sides so that gorgeous Chocolate Chip Stitched Ribbon would wrap around it nicely and not stick out. For my focal point, I stamped the tall pumpkin, also from Autumn Harvest, in Chocolate Chip on to Very Vanilla Cardstock. I also stamped it again on the Tangerine paper from the Frosty Days Designer Series Paper. This was cut out and layered on the Vanilla piece. The stem and grass was colored in using my Aqua Painter and the Old Olive ink refill. 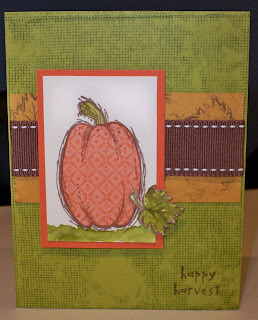 I layered the pumpkin onto Tangerine Tango cardstock and stamped, colored and cut out the little leaf accent. This was mounted on a dimensional and placed just so on the front of the card. Locating a rarely used stamp set in my studio, Loads of Love Accessories, I stamped the Happy Harvest greeting at the bottom right with Chocolate Chip ink. This was a fun card for me to make and I hope fun for you to look at! Be sure to check out all the other Blogger's Challenge players by using the link on my sidebar. There are some really talented stampers there and I know they will wow you! After you do that, go buy yourself a bag of chocolate and lock the front door - you need it worse than the kids do! Love that paper-pieced pumpkin! Super cute colors and a great card! Awesome card. Your pumpkin looks great with the patterned paper, and your leaf embellishment is perfect. Happy Halloween! Great card - I LOVE fall and the colors so this card is perfect. I love all the details on it! Very pretty, Robin! Great job with the challenge. Love the paper pieced pumpkin! Gorgeous Card Robin! Get down with your bad self! Great job with the challenge. I love it when people stamp images on DSP and cut them out! CUTE pumpkin! Cute card! Great for Thanksgiving or for those who don't "do" Halloween. Your harvest card is perfect. The paper piecing is beautiful!! love it! especially the pumpkin! Ohh this is great! Love your paper pieced pumpkin and the fall colors! TFS! Very Nice card. The paper piecing on the pumpkin is great! Nice card. This pumpkin is perfect for paper piecing--and the tangerine color works well! That pumpkin looks so good, I could eat it. Love the paper piecing, the layout - basically everything about this card. Pretty fall card, Robin! I really like the paper pieced pumpkin. Great pumpkin. Lovely card. TFS!